Heracles (Ancient greece Ἡρακλῆς μαινόμενος, Hēraklēs Mainomenos, also Hercules Furens, Alkides, Palajmon) is an athenian tragedy of Euripides. Heracles( 'who acquired fame at Hera ; Heras good name, rom. latein. Hercules) is also a Greek mythical hero who was most recently admitted to the Olympics because of his exploits. He was depicted with the skin of the Nemean lion as well as with a club and a bow and a quiver. Heracles was said to be a son of Zeus and the Perseus-daughter Alcmene ('the power of the moon') , the twin brother of Iphikles, the first husband of Megara (with her he had three - to 12 - sons), the second husband of Omphale, husband of Deianeira and Auge, and after his death husband of the goddess Hebe. He was as well looked at as the lover of the Iole and Abderos, and the father of many children. Sources for the Heracles myth are found in the greek and latin literature with different functionalizations. The Parthians identified him with the ancient iranian deity Verethragna (avesta : Vərəθraγna). In Gandhara in western pakistan he was looked at as the Bodhisattva Vajrapani, but Heracles used further wapons. In the last centuries Pierre J. Fabre in his Hercules piochymicus und Alice Bailey in her 'The labours of Herakles' added their interpretations. Heracles was also looked at as a cousin and friend of Oionus, great-grandfather of the Hippot and the Deiphont, and ancestor of Polyphontes. His foster father is Amphitryon. He belongs to the family of the Perseids through the genealogy of his mother. Heracles was also regarded as a healing and oracle god and protector of sports and palaces, and he was a protege of Athena. There are different legends around him. A characteristic is his outburst of temper, but the anger of Achilles is also a theme in the Odyssey. Theseus was another hero, who experienced adventures, but his personality was different. Another form of Heracles was Herakles Idaios, the founder of the Olympic Games. The Heracles myth was actually a veiled description of the path of initiation to enlightenment which is only understandable for the initiate of Mystic. It also containes the knowledge of the Mysteries of Ephesos. The myth was commented and supplied by poets such as Euripides, Homer, Sophocles, Pindar, Ovid and Tzetzes. In order to understand the deeper meaning of the 12 deeds, the knowledge of the eight cycles of Ashtanga Yoga, which moves within the framework of the Universal Path, as well as the alchemical so-called planetical cycles addressed in each cycle, is indispensable. Although certain planets are also associated with gods in Greece, it is not that simple. Heracles was the son of Zeus and the beautiful Alkmene (from the family of Perseus), who was shrewd with the theban King Amphitryon, who had accidentally killed Alkmene's father Electryon. His twin brother Iphikles (iphios-kleos: strong fame), whom the mother received from Amphitryon after the disguised Zeus had just removed from her arms, was born the following night (this was first later added). The ever-awake jealousy of Hera was fierce, and she thought of revenge for the perfidy of the husband of Zeus : A so-called 'divine child' would only have been born from a union of Zeus and Hera. The allegory is that Heracles is at first the mortal 'Jiva' in man who has to go the long path 'over 7 bridges' (or cycles). Therefore, Zeus (similar to the Atman by the Koshas) is dressed in a human form, and with Alcmene ('Power of the Moon'), a mortal child with high facilities is generated. When Heracles was eight months old, Hera placed two large serpents in his cradle, which Heracles strangled (U.L. 1.2) , while Alkmene's son Iphikles fled. Heracles was then trained in the art of wagon-steering, archery, fencing, fist-fighting, and wrestling (U.Path, step 2.1-2.4, corresponding to the YAMA of Ashtanga Yoga). He was also taught singing and playing on the lyra. The lyra was also considered the invention of Hermes, who handed it over to his god-brother Apollo as compensation for his theft of cattle. In Greece, the Zeus - son Amphion and Orpheus and Linos were the inventors of a song accompanied by the lyre, of which miracles were said. Heracles was extremely docile but also very quick-tempered (fire principle). When his music teacher Linos ('Flax'), blamed Herakles for allegedly not mastering the lyre, he slew him furiously with the lyre (U.Path step 3.1), i. : He applied the power superimposed on the sounds (3.1 Mercury phase), which initiated the next cycle with the earth element - phase and a further purification of the death forces of the physical unconscious (Saturn phase, Raven). (Every cycle of the first 8 doublesteps begins with a mystic death). Greek mysticism knows similar to the dark Maya - patala wrath-forces the Tartaros (underworld) and Erebos (darkness). Foster father King Amphitryon ('the double-stricken', harassing on both sides - a symbol of the human mind), a son of the Perseus son Alkaios ('strength'), sent him thereupon to the Kithairon (' Placelessness') to his cattle herds. Xenophon (Memorabilia 2.1, 21-34), which was taken over by Prodikos of Keos ' Herakles at the crossroads'. Here, the two allegorical forms of women Eudaimonia (earthly bliss) and Areté (virtue) fight for the favor of the youth - which happens already on step 4 of the Universal Path. (Niyama of Ashtanga Yoga). On the Kithairon, Heracles grew up among the cattle herds to a youth. His astral body, his vitality and his mental body were trained and refined here. (U.L. 4: Niyama). Here he also performed the first heroic act when he killed the wild Kithaironian lion, who attacked the kingdom of Amphitryon and his herds again and again. Heracles then freed the Thebans from the tributary of the neighboring king. King Creon therefore gave him his daughter Megara ('Pearl') as wife (U.Path 4.1: Luna-Phase connected with purity and U.Path. 4.2 Venus phase), whom Kreon brought into the house of Amphitryon. The vindictive goddess Hera now tried to harm the son of Zeus. She clouded his mind with madness, and Heracles killed his wife Megara and the three (up to 12) children during one of his attacks. The Tarotcard 5 shows similar one disturbed person : At the beginning of the third main cycle on step 5.1 takes again a mortification of unconscious, close-to-the-body forces place. (According to Pherecydes he sent his '12' children into the fire : Step 4 Phase 3: Mars phase: fire). According to Plutarch (Moralia "Dialogue on Love / Erotikos / Amatoria", Loeb, v. XII, p.339), Megara was only handed over to Iolaus when Heracles left Theben for ever. From Iolaus she then had the godlike-beautiful daughter Leipephilene (Greece . : Λειπεφιλήνη; also: Leipephile). Eurystheus was a son of the Perseus son Sthenelus, who was the uncle of Amphitryon and King of Mycumn, and of Nicippe. He was born by Heras intrigues just before Heracles. Eurystheus gave Heracles twelve tasks, which were known as the 12 deeds of Heracles (Greek Dodekathlos, Twelve contest)[3,4]. They were in fact only 10 tasks, since Eurystheus did not recognize two of them. Heracles killed the Nemean lion, who at the instigation of Hera, the sister of Zeus, and therefore the daughter of Kronos and Rhea, was up to mischief . He corded up the lion's throat, so that he stifled, and from there on carried the lions coat, which made him almost invulnerable. (U. Path step 7 - Pranayama At first the lower libidinal pranas are purified.) The Ephesian Artemis is also depicted with three heads of lions below the abdomen. From then on, regarding to Pierer's Universal-Lexikon, the anxious Eurystheus wanted have had the tasks handed over only by the messenger Kopros . He killed the Hydra, a daughter of the serpent Echidna. Hesiod described Echidna in 'Theogonie - 295..332' as a huge unspeakable monster, half beautiful-eyed girl, half ghastly snake, colorful and voracious. The Earth DragonTyphon witnessed with her the two-headed orthos, the three-headed hell dog Kerberos, and Hydra, also known as the 'Lernaeian Snake'. In addition, Typhon and Echidna witnessed the Chimaira, the Sphinx, the Nemean Lion and the Phaia, as well as a giant eagle named Ethon. The Hydra (Lernaîa Hýdra) lived in the marshes of Lerne. Her cave was on a hill near the springs of the Amymones. For each beheaded head grew two new ones. The ninth head was yet immortal. Heracles went to her together with Iolaos (evtl. from: ios (arrow) and laos (men) = weapon or strength of men), a son of Iphikles, who also participated in the Calydonian hunt for the wild boar. When he had struck off a head, Iolaos burnt out the spot with fire, so that no new head could grow. (U.Path 8.3 Marspahse. Fire). Hercules then dipped his arrows into her poison. Sice that the arrows produced incurable lethal wounds. (U.L. Step 8 Pranayama and 9.1 Begin of Pratyahara). In addition, Herakles killed the cancer karkinos (Carcinus - whom also tarotcard 18 shows), a symbol for the still angry unconscious(Apollodorus, Bibliotheca 2. 77 - 80; Plato, Euthydemus 297c ; Pseudo-Hyginus, Astronomica 2. 23), who supported the nineheaded hydra during the fight in Lerna. But Eurystheus did not acknowledge the job since Iolaos had helped him. Snakes: In the Muladhara Earth Chakra sleeps the fiery Kula kundalini snake with the Ra Fire - Triangle. Above this in the six-leaved Swadhisthana-Chakra is another snake, the prana kundalini. It is assigned to the material aethers(pranamaya kosha). The abode is assigned to the water element principle (marshes). Above that is the Manipura Fire Chakra. Herakles caught the deer cow Kerynitis, which devastated the fields in Arcadia. The goddess Artemis had five gold-horned sacred deers. Four of them pulled the wagons, while the fifth, the kerynitic doe, rode freely. She grazed all over Arcadia and on the Artemis mountains near Argos. The deer cow was dedicated to Artemis by the accompanying nymph Taygete, daughter of Atlas and the Okeanos - daughter Pleione. She had golden hooves and a golden antler. She was so fast that she could run off an arrow. Herakles hunted for a whole year in vain (corresponding to the long lunaric phase 10.1) and could finally catch her by surmountig a net (that is, the network of Nadis, through which the etheric forces are channeled) while she was asleep. Hercules broke off a golden horn (stage 10.2 Venusphase). Thus, the deer cow became a unicorn. The deer symbolizes the speed of the forces of spiritual progress and is also a hint on volatile ethers. 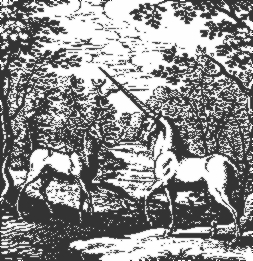 A similar 'Cervus Fugitivus' is known in spiritual alchemy. In the following phase he is replaced by the unicorn (Venus phase: Virgo ties Unicorn). Herakles brought the wild erymanth boar, a descendant of the mighty sow Phaia, who lived on Mount Erymanthos and destroyed the surrounding fields in his rage, living to Mycena by driving him into a snowfield. He marched out the stables of the Augias, where over 3,000 cattle were kept, which had not been cleaned for thirty years. He directed the water of the rivers Alpheios (Ἀλφειός, whitish) and Peneios (Πηνειός shining) through a canal through the stable. Because of the ruse King Augias became angry and regarded this as an attack on his throne and exiled Hercules. He chased the stymphal birds, crane-sized bird monsters with iron beaks, claws and wings, with which they could even pervade the armor of the warriors. They were able to shoot their metal feathers like arrows on their victims. They lived on a high plateau in a lake near Stympalos, killing man and animals with their feathers. Athene gave Heracles two bronze rattles, which she had received from Hephaestos (God of Fire in the Olympus), which flushed the birds, and - according to Ovid - Heracles was so able to slay them with arrows . This 6th task Aufgabe contains the Saturn-phase and also the earth element-phase of the mystic death (U.Path 13.2): The adept had also completed step 6 or Dharana, the natural one-pointed concentration of Ashtanga Yoga. The lake represents the individual unconscious, which is here still samsarian, but already clarified (therefore the high mountain plane). The birds are here still with their legs connected with the samsara. The lake is similar to the red sea of the Israelites or the sea of Jonas with the whale for the samsarian vital plane. The birds stand for the individual soul and resemble the Egyptian Benu. Their feathering symbolizes the garment of wisdom and truth. The concentrated arrows of wisdom penetrate everything and kill the all too human and the animalistic that the Adept wants to discard. The black raven of spiritual alchemy corresponds equally to this step 13.2 ('Nigredo'). The clutter given by the wisdom godess Athena represents a certain mantric force. The birds are thus flushed into the sky (U.Path 13.3 Jupiter-phase), so that they do not return, and the adept enters the Lunaphase 14.1 of transformation of the material body. The white bull was sent from Poseidon to King Minos of Poseidon. (King Minos symbolizes the mind - Manas. On the water phase 3 of step 13 follows the long white lunar phase 1 of step 14). Minos hid the bull overwhelmed from his beauty in his herd and sacrificed Poseidon one of his animals instead. The cretan bull was therefore beaten with frenzy by Poseidon, and he caused great devastation on Crete. Heracles brought back the raging bull of Poseidon from Crete riding on his back through the sea to Argos and to Eurystheus on the heights of Mycenae, where he showed him the bull. The white bull symbolizes here the body with the etheric body to be transformed by the ananda. Eurystheus wanted to sacrifice the bull to the goddess Hera, but Hera rejected every gift from Heracles, and so the bull was released. He came to Marathon and did damage and killed people. He fetched the man-eating mares of the thracian king Diomedes (Dios: from Zeus, médon: Regent ; medomai : think, plan), the king of the bistones and son of Ares and the Nymph Kyrene(altgr. Κυρήνη : highest ruler) to Mycenae(Nymphs are forms of self-preservation drive). Diomedes corresponds esoterically to the intellect (Buddhi). These four horses were so fierce and strong and impetuous that they were tied with an iron chain to the iron feeding crib. According to Hyginus, their names were Deinos (the Terrible), Lampon (the Shining), Podargos (the Fast), and Xanthos (the Blonde / Pale). Their only food was human meat. - Regarding to Diodorus Herakles feeded them at first with Diomedes himself and could then lead them tamed towards the sea (-> step 15.3 Water). -After Pindar, they were tied to a bronze chain, and Heracles fed the stallion, whom they eat so that his bones cracked, and Heracles could loosen the chain, i.e. liberate the astral body from the lowest bindings. According to another version the hippomania of the horses was caused by the river Kossiniti, from which they drank. Buddha, in this context, leaves his by his servant Channa caressed horse back and crosses the river noma ('splendid, sublime, glorious') and goes to the path. This eighth test follows on the end of the first big initiation(U.Path 14.4) , which concerns the material body. It is the beginning of the second initiation, concerning the astral body, i. first a liberation of the astral body from the binding at forces close to the body takes place. The wildness is an astral characteristic. U.L. 15.2 Saturn-phase: The horses symbolize here the force of Tapasya. Herakles brought the armamentarium of the amazons queen Hyppolyta(' Release the horse '), daughter of Eurystheus and priestess of Hera, who had got a magical belt from her father and war god Ares, who was hated at the gods, for Admete ('Untamed'), daughter of Eurystheus and priestess of Hera. The Amazons were a race of warriors. They descended from the war god Ares. They sometimes met with men from other nations to create future generations, but they only let the girls grow up and killed the boys. Heracles started out with an army on the way to the capital Themiskyra at the river Thermodon. When Hyppolyta hears from his task, she promises to leave him the belt voluntarily. Hera tried to bring the project to a failure and spread among the Amazons that Heracles wanted to abduct Hippolyte. A war broke out with the Amazons in which Heracles Hippolyte was killed and took off her. In another version Herakles kills many of her best warriors and captures some. In exchange for her captive sister Melanippe ('dark mare' - black horses symbolize the lower thinking with its false ideas), Hippolyte finally handed over the magic belt to Heracles, who then sailed back to Greece.. The magical belt is a symbol of the mastery of the manipura chakra, symbolized by the city of Themiskyra, and of the astral body. (U.L. 15.4 to 15.5 : Venusphase). The Alchemical Rebis wears this belt too. Hera as a higher divine nature allows no compromise with the astral forces. He brought the cattle of the giant Geryon, who lived according to Hesiod on the island Erytheia (Red-land, Land of the Dusk). Geryon had three bodies grown together at the waist. He is often portrayed with three swords and shields and sometimes also winged. His herd of red bulls was guarded by the shepherd Eurytion and the two-headed dog Orthos ('dawn'), a brother of Kerberos (or also guarded of Kerberos himself), who was placed in the world by Typhon (Typhoeus). Heracles killed the guardian Eurytion ('widely honored') and the dog Orthus. According to Hesiod, Orthrus was the father of the Sphinx and of the Nemean lion. Geryon symbolizes the unity of the body, mind and soul of the developed aspirant. Heracles, however, is the higher spiritual Jivatma. Hera, the higher nature, who had approached to support Geryon was wounded by Heracles and put to flight. (U.L. 16 : alchemist red lion, fire element, Marsphase). He got the apples of the Hesperides (Aigle, Arethusa, Erytheia, Hespere, Hesperusa, and Hespereia), who were considered nymph-goddesses of the evening and the golden light of the sunset. Often, Erebos (personification of darkness) is called their common father, or Atlas, sometimes Hesperos (the evening star). 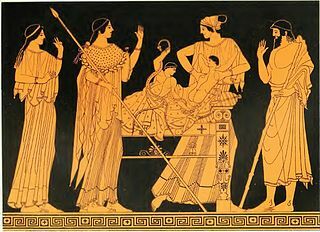 Hesiod mentiones Nyx (the goddess of the night) as their mothers. According to other sources, it is Hesperis as a female incarnation of the evening star (Roman Venus). The Hesperides guarded a wonder tree with golden apples in a beautiful garden, which Gaia of Hera had grown to her wedding with Zeus(: Like the wedding of Shiva and Parvati - by which Parvati became Mahamaya). The apples gave the gods eternal youth. The tree was guarded by Hera's hundred-headed dragon Ladon(Hesperidos). After Heracles had handed over the apples to King Eurystheus, the latter directed them to Athena, who placed them back in their place. (The tree with the golden fruits is the symbol of eternal youth or love and fertility.) This step 17 of the U.Path corresponds to the seventh cycle planet Sol). Consciousness has now also conquered the deepest underworld. The corresponding Tarotcard 18 accordingly shows a clear lake. Thus Heracles was liberated from the service of king Eurystheus, and he executed further heroic deeds. He came to Kalydon, where king Oineus('Wine-Maker'?) ruled. Heracles immediately fell in love with his beautiful daughter Deianeira (Greek Δηιάνειρα - the men hostile, men-destroyer), which the king had promised to the River God Achelous. But Deianira did not love Achelous, since he could take the form of a snake or of a man with an ox's head or an ox. In order to win her, Heracles first had to defeat Acheloos. He finally succeeded in defeating the ever-changing river god with his superhuman powers. During a voyage with his wife through Thebes, they crossed the river Eunenos ('innocent, not evil') where the centaur (half man half horse) Nessos lived, who offered travelers as a ferryman. Heracles set first and Deianeira followed. In the middle of the river the centaur to abuse Deianeira. Heracles heard her cries for help and reached for his bow. The arrow wounded Nessos deadly. As he was dying, the Kentaur whispered slyly to Deianeira, to catch his blood. If she watered the garment of her husband, she could be sure of his eternal love. 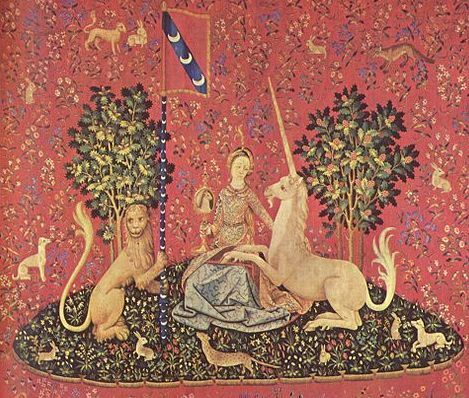 Deianeira believed the Centaur and followed his advice. The centaur represents here the not yet fully purified mental desire(kama manas), which then makes sunningly use of the snake, which also appears in the region of the manas-chakra at the forehead of several pharaos. When Heracles then to thank Zeus with a thank offering for the victory, he sent for new clothes, and Deianeira gave the messenger a garment soaked in Nesso's blood(Herakles should have seen that..). The toxic blood of the centaur burned into the skin of Heracles at the sacrificial ceremony, but he could not tear his robe from his body, screaming with pain. When Deianeira had realized what she had done, she committed suicide of pain. Heracles went up to the mount Oeta. He let because of his pain build a pyre and entered the pyre. He ordered his friends to light it, but no one dared. Suddenly the lightning of Zeus inflamed the pyre (U.Path 19. 2 Mars, fire - after Ovid it was Philoctetes), and a cloud enveloped Heracles and carried him into the Olympus, where he ever since lives with other immortal gods. In other words : Heracles as Jivatma has achieved his liberation(Moksha), the complete enlightenment without returning to the consciousness of the body and the mental ego. The mount Olympus stands for the Nirvikalpa - Samadhi. Heracles is now deified like a true son of Hera. According to another version, his torments afflicted Hera, the higher divinized nature, and Heracles was married to her daughter Hebe, the goddess of youth and Ambrosia-cups barrier of the gods at the heavenly feast, from which he sir had the sons Alexiares(' War defending ') and Anicetus ('unconquerable'), who were also the goalkeepers of Olymp. Karl Galinsky: The Herakles theme. The adaption of the hero in literature from Homer to the 20th century, Rowman and Littlefield, 1972, ISBN-10: 0874711134 ISBN-13: 978-0874711134. Karl Kerenyi : The Heroes of the Greeks, Thames and Hudson, 1959.